During the Congressional luncheon and briefing in Washington, Artsakh Republic President Bako Sahakyan announced the awarding of Presidential Medals of Gratitude to a number of U.S. legislators, including Senator Jack Reed (D-RI), House Foreign Affairs Committee Chairman Ed Royce (R-CA) and Ranking Democrat Eliot Engel (D-NY), and Representatives David Cicilline, Jim Costa, Brad Sherman, Adam Schiff, and David Valadao. The Medal of Gratitude is awarded to individuals, organizations, and collectives for significant contribution in restoring and developing the economy, science, culture, social spheres of the NKR as well as for defending and promoting international recognition of the Republic. After thanking President Sahakyan for the honor, Rep. Cicilline noted, “I know that the relationship between Artsakh and the United States is a strong and important one and we will continue to do everything we can to support the aspirations of your countrymen and women and be sure that they enjoy freedom and independence and self-determination.” He went on to praise the active efforts of the Armenian community in his state in support of Artsakh freedom and recognition. “Rhode Island was the first state in the country to recognize the independence of Artsakh,” said Rep. Cicilline, citing the efforts of ANC-Rhode Island leader Ani Haroian and his own staff member Lisa Sarkisian Tatarian. 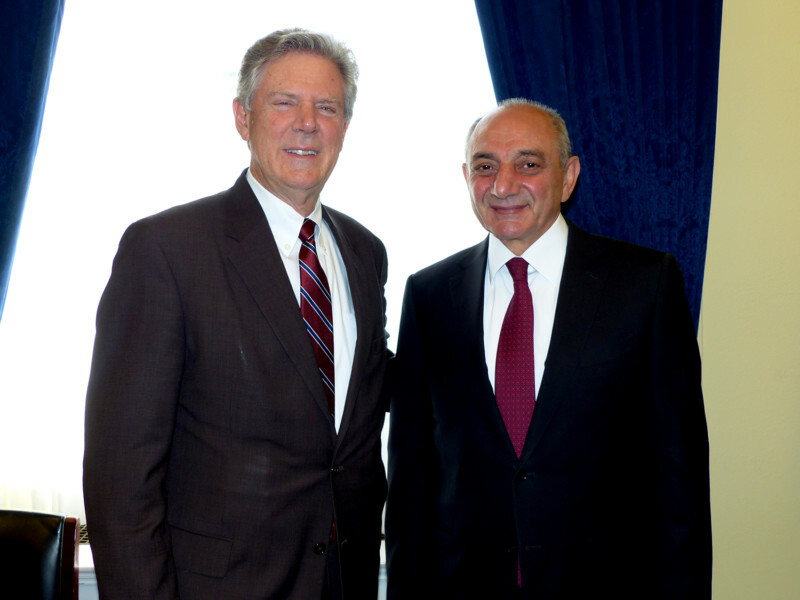 Rep. Sherman explained that “For 22 years I have served on the Foreign Affairs Committee – and Mr. President, this award is very important to me because one of the first things I did on the Committee was to introduce an amendment which would provide direct aid to the people of Artsakh. The State Department opposed it on the theory that it would be an implicit recognition of your independence. I thought, as they say in Silicon Valley, that’s not a bug, that’s a feature. And so, we secured $12 million to help people who needed help, who were suffering as a result of war and hostility – and we implicitly recognized the Republic of Nagorno Karabakh – now the Republic of Artsakh,” noting the important next step of explicitly recognizing Artsakh’s independence. “It was a great honor to be the first member of Congress in over a decade to touch soil in Nagorno Karabakh and see it for myself,” said Central Valley California Congressman David Valadao (R-CA), who travelled to Artsakh in September, 2017, after having successfully spearheaded the Valadao Amendment securing $1.5 million in U.S. assistance for ongoing demining efforts through the HALO Trust. “I still remember driving around Nagorno Karabakh and seeing all the families, the kids outside their living lives. You hear on the outside of the shelling, the sniper fire and the rocket fire in such a small country but people are living their lives just like our families here. So the resilience, the strength, the courage, of so many people is amazing to see,” concluded Rep. Valadao. 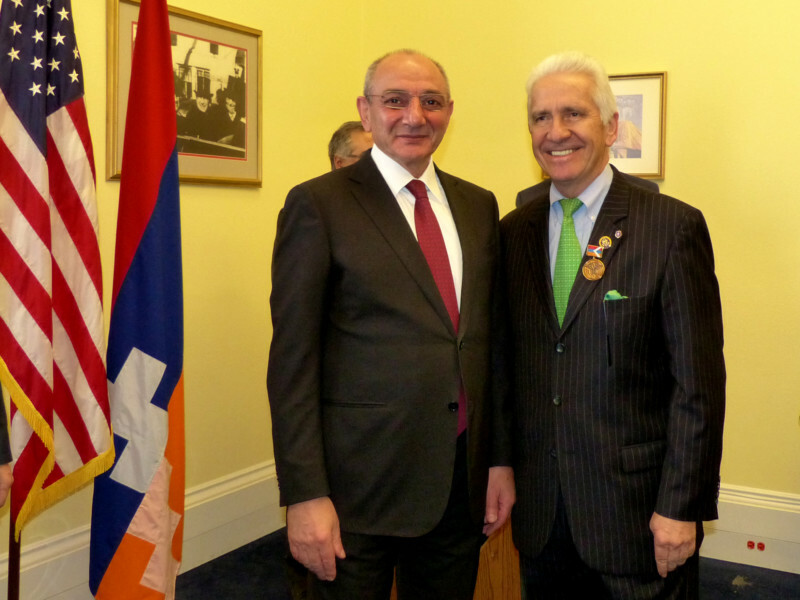 “It was an honor to be awarded the Gratitude Medal by President Sahakyan today,” said Rep. Costa. We must continue to do all that we can to support the democratic independence of the Republic of Artsakh and the nation’s rightful exercise of self-determination.” On February 27th, Rep. Costa issued a powerful video statement marking the 30th anniversary of the Sumgait pogroms against Armenians. He was later joined by Representatives Pallone and Schiff in condemning the attacks and calling for justice for the victims. President Sahakyan is on a week-long working visit to Washington, DC, where, in addition to meetings with Congressional leaders, he and his delegation will be meeting with media representatives and think tank experts.